D.A.D. (Dry Air Demand) Patent Pending First Stage by Genesis Scuba. An environmentally sealed, extremely high performance regulator. A regulators' first stage works by taking the air pressure from your tank and reducing it to a lower, consistent pressure. Your first stage will supply this constant pressure whether your tank is full, almost empty, or in between. As you enter the water and begin your descent, the surrounding water pressure increases. Your first stage must -sense- this increasing pressure and adjust accordingly. Most first stages allow water inside to -push- on a piston or diaphragm exposing the interior to the harsh elements. This can cause reduced reliability and more frequent maintenance. Genesis Scuba's D.A.D. First Stage maintains a -seal- of air. No water, silt or sand enters your first stage. Only the correct amount of air is added during descent to maintain equal pressure. During ascent the air in your first stage expands and the air is vented. The D.A.D. First Stage is sealed from the environment providing greater reliability, less maintenance and higher performance. A great regulator for the price! Pre-dive/dive switch to prevent unwanted freeflow. Factory set diver inhalation effort. 302 passivated stainless steel lever. Nitrox (EAN) Compatible to 40%. This regulator is ScubaPro's top of the line balanced piston first stage coupled with the improved version of the tried and true G250 regulator. I have been diving this regulator combination since March 2002 at the rate of two dives every other weekend. Each dive has been between 100' and 150' in a cold freshwater lake. This regulator has delivered air at these depths easily and consistantly. It breathes better than any of the other regulators that I have. 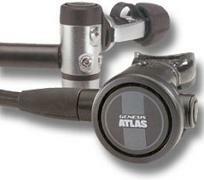 The dive shop where I purchased this regulator set carries Oceanic, Mares, Abyss and ScubaPro. They can get any one of the previously mentioned companies regulators. The ScubaPro Mk25/G250HP is the regulator I chose from among the best that they all have to offer.